Still a kid friendly park? Sorry, there are no comments at this time. Be the first to add a comment. 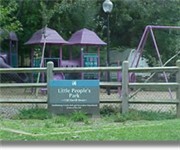 How Would You Rate Little Peoples Park? 1. Is the park, playground or recreational facility safe? 2. Is it clean and well maintained? 3. Does the park provide an active, creative or educational experience? 4. Is the park parent and child friendly? 5. Is it toddler, pre-k, small and big kid friendly? No tags yet, be the first to add one.